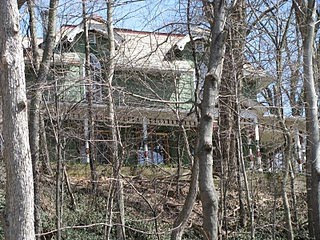 Haunted, though it may be, this house in Kent, Ohio is not the Psycho mansion. Nor is this slice of Santa Cruz gingerbread. Various theories have been put forth regarding the origins of Psycho’s Bates Mansion. Author James Michener once claimed that it was based on a Victorian-era, reportedly haunted, house in Kent, Ohio. 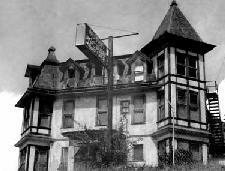 Another rumor maintains that it was based on the Hotel McCray of Santa Cruz, California. Wrong and wrong. The fact of the matter is that the architecture is more-or-less original. "The mysterious atmosphere is, to some extent, quite accidental. For instance, the actual locale of the events is in northern California, where that type of house is very common. They're either called "California Gothic," or, when they're particularly awful, they're called "California gingerbread." 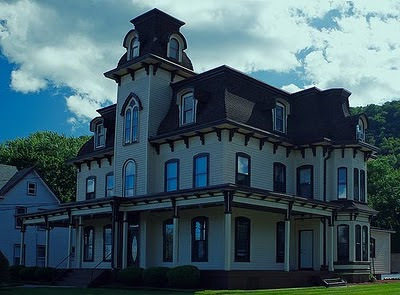 That said, Hitch, as you might recall from my November 23, 2009 post, named Edward Hopper’s 1925 painting House by the Railroad as the specific inspiration behind the Bates Mansion. That is to say, while the architectural details came from any number of sources (even as the house parts themselves were cadged from other sets on the Universal lot), the Hopper painting provided a basis for the mood of the Psycho house, which would be delivered through lighting, editing, framing and other cinematographic techniques. Okay, but where did Hopper get the idea for his painting? What was his model? That would be the large house (now subdivided into apartments) that sits on Route 9W just north of the entrance to Main Street in the village of Haverstraw, New York. While at one time it was a grand home, the place later went to pot. Vagrants even squatted there for a time until district attorney of Rockland County, Thomas Gagan, purchased it 1919 and (presumably) renovated it. Gagan’s daughter, Amo, occupied a bedroom on the second floor and stayed in the house for over half a century. No doubt she occasionally took visits from Hopper fans and, perhaps, later, Hitchcock fans. You can read about her and the house in this article from the Atlantic Monthly. There was, however, one particular visitor who remained lodged in her memory for the rest of her life. That encounter occurred one day when she was 13 years old and happened to be alone in her room. Looking out the window, she caught sight of a man across the tracks, seated at his portable easel, creating an American icon, one brushstroke at a time. The original house by the railroad. Interesting info on the housing front. the 50th anniversary and a re-release this year of the film ... I shall catch it at the cinema! My Coen brothers phase continues and Hitchcock is an amazingly huge influence on them. From the murders gone wrong to some of the shots. Its wonderful! I think every small town in america must have at least one Gingerbread Gothic that locals dub "The Psycho House." Most of these places have been reahbbed or torn down now. The vacant vertical eye of the front door glass no longer haunts or landscape in the same way. Stupid Urban Renewal. Joel, this is a very informative post...and the Psycho house looks even creepier during the daylight. "There was, however, one particular visitor who remained lodged in her memory for the rest of her life. That encounter occurred one day when she was 13 years old and happened to be alone in her room. Looking out the window, she caught sight of a man across the tracks, seated at his portable easel, creating an American icon, one brushstroke at a time." ...I wonder whom the artist at the easel was? By the way, I met (Well, not directly, a lady (a fellow blogger) whom claim to be Alfred Hitchcock's great great niece. I wonder if that is true? Thanks, for sharing the links too! I know! I think my Portland, Oregon has a Psycho house or two. Sure, Hitch had (I think) three grandchildren, so why not? Cartoonist Charles Addams had been using this style of house in his New Yorker cartoons since the 1940s, so he also set the stage for the Second Empire house to become the iconic haunted house style. Where did he get the idea for the layout of the motel? I agree with James Michener. The pic above of the house in Kent, OH was taken at an unusual angle. If you looked up at that house in the late 1960's from N. Water St., it was set on top of a hill & truly looked like the Bates Mansion...hands-down. Just about every city in America that has creepy Victorian houses that has one which locals refer to as the Psycho House. So let's put the rumor to rest and for all. There's no doubt about it. Michener got his facts wrong. It greatly resembles a house located on the back road to Pismo Beach in California. It stood on a hill, with a ratty trailer park below. Wish I had a picture, because it was a dead ringer for the Psycho house.